The other day I was standing in my kitchen when I heard a little snigger from behind me. You know someone is up to mischief before you even turn around…and they were! My little three year old had a block of butter in one hand and a spoon in the other and he was ready to dive right in…. ……………………………”MAMMY, CAN I HAVE SOME BUTTER?! I am probably about to unleash a tirade of abuse when I reveal my reaction to the request…I walked over, dug the spoon into the butter and presented it to my happy child. I then removed the butter – job done. In my mind a win-win situation. I believe there can be benefits to feeding a spoon of butter to a growing child now and then! My mother in law reared nine children and she wisely observed that each went through a stage in their younger years of literally craving butter. She believed they were following their instinct for necessary saturated fats, required for their rapidly developing brains and nervous system – and I am in her camp! Butter making in Ireland goes back thousands of years and was originally performed by women who herded and milked the cattle on higher pastures in the Summer. As time progressed milk production evolved techniques to enhance preservation, such as adding large quantities of salt and burying the butter in bogs (due to the turfs antiseptic properties). In the seventeenth and eighteenth centuries Ireland was the dominant exporter of butter to Northern Europe and the Americas. I have always had the opinion that we should aim for the more natural source of a food, the least processed the better. Following this gut instinct I have always chosen butter over margarine or spreads. Before I get into the fat and cholesterol issues let’s look at what else can be found in our pound (or 454 g for all the metric people) of butter…. Butter contains the fat soluble vitamins A, E, K and D.
Vitamin A is required for healthy body growth and development, for maintenance of a healthy immune system and for good vision. It also acts as an antioxidant, but how much is really in butter? One teaspoon of butter will provide about 2 percent of your RDA (recommended daily allowance) of Vitamin A.
Vitamin E is another good antioxidant and also contributes to healthy skin, hair, nails. One teaspoon of butter contains approximately 0.7 percent RDA. The primary role of Vitamin K in the body is to assist in the correct clotting of blood, without it we cannot seal and heal wounds. There is about 0.3 percent RDA of Vitamin K in a teaspoon of butter. Vitamin D plays an important role in the absorption of calcium and phosphate within the body, thereby required for healthy bones. While some of these levels of vitamins are low, they are fat soluble vitamins and are therefore more easily absorbed into our bodies due to presence of fat within the butter. Low levels of B Vitamins and Vitamin C are found in butter. Butter contains Calcium, Phosphorus, Magnesium, Potassium and Iodine, all essential for healthy bodily function and immune system; Butter also contains trace elements such as selenium which is a natural antioxidant. Most of the butter found on Irish tables is typically made from just one natural ingredient – cow’s milk. It is made from churning fresh or fermented milk or cream. The Vitamins and Minerals found in butter are naturally present (although these may sometimes be added during production). Butter usually contains salt. 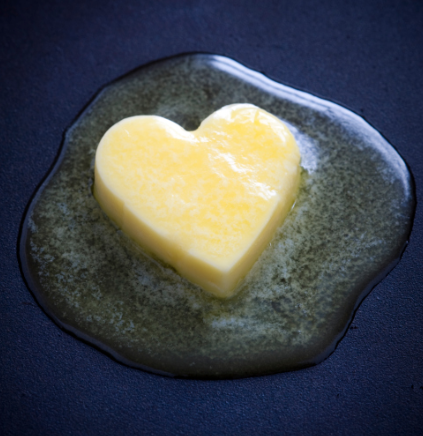 Butter is high in saturated fats (often associated with cardiovascular disease). Margarine is made from a number of ingredients, the base ingredient is typically a plant oil. These oils contain a lot more poly unsaturated fats than butter. However in order to make the product solid a small amount of saturated fats are introduced. The processing of margarine and the introduction of saturated fats requires high temperatures which create additional unwanted fats… called trans fats. Vitamins and Minerals are often added to the margarine during manufacture. Additional colouring is also added, otherwise the margarine would be grey! SO WHAT ARE ALL THESE DIFFERENT TYPES OF FATS? Saturated fats, Polyunsaturated fats, Trans fats…. what does it all mean. Basically saturated, polyunsaturated and trans fats are made of of the same things, put together in a slightly different way. Saturated fats are typically solid at room temperature and are found in animal derived products, such as butter, milk, cheese and meat. There are also some vegetable fats that are high in saturated fats, usually tropical oils such as coconut oil, palm oil and cocoa butter. Polyunsaturated fats are usually liquid at room temperature and are found in larger qualities in vegetable and plant oils, some nuts and cold water fatty fish. Trans fats are sometimes found naturally in trace amounts but the larger amount in our diets comes from processing of polyunsaturated fats. Partial hydrogenation of these fats results in the production of trans fats. Consumption of artificially produced Trans fats have been connected with an increased risk of hearth disease. Trans fats present naturally in ruminant animals may actually have health benefits and are not directly linked to the negative effects on health associated with their industrial counterparts. CHOLESTEROL … LDL AND HDL, WHAT IS THE DIFFERENCE? 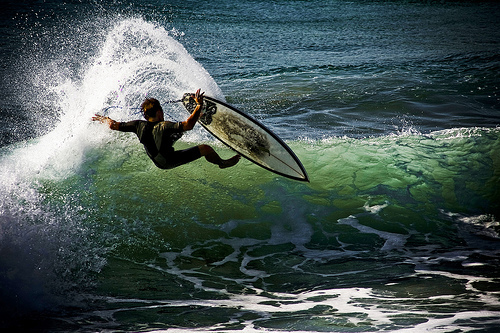 These days cholesterol is thought of as a dirty word, but it is not all bad. Cholesterol is an essential fat and plays an important role in maintaining a healthy body. Some cholesterol we get from our diet and some is made in our livers. Cholesterol cannot move around the body on its own, it need to be transported through the bloodstream by carriers called lipoproteins. The lipoproteins we hear about most often are LDL (low density lipoprotein) and HDL (high density lipoprotein). LDL transports cholesterol around the body using the bloodstream as its highway. However, when we have too much cholesterol the LDL starts depositing it in the arteries and these can build up and form blockages. This is why high levels of LDL cholesterol is considered a BAD thing. HDL on the other hand goes around mopping up excess cholesterol and transports it back to the liver. This is why HDL cholesterol is considerd the GOOD guy! Saturated fats are essential for healthy development and function of the body. A diet with sufficient saturated fats allows for a healthy immune system, blood cells, nervous system and brain function. The first food we make for our babies – breast milk – contains more than 50% saturated fats… this really emphasizes the importance of saturated fats in the development of babies and young children. Our brains are made up of about 60% fat; this fat content includes polyunsaturated fats such as the Omegas (3 and 6) but the largest portion is saturated fats. We need saturated fats in our diet in order to maintain a healthy immune system: without it we deplete the ability of our white blood cells to recognise and destroy invading antigens such as viruses and bateria. So our need for saturated fats extends far beyond our early development, saturated fats are a constant requirement throughout life (they can even reduce the signs of aging by maintaining a healthy elasticity to our skin). Our lungs need a thin layer of a lubricant, called a lung surfactant, within the air spaces, in order to function correctly and stay healthy. This surfactant is made up of 100% saturated fats. Despite the fact that saturated fats in the diet have been linked with an increased risk of heart disease there is much evidence to the contrary. Saturated fats in the diet can actually increase levels of good cholesterol (HDL) that is used to mop up excess cholesterol, as explained above. Also, saturated fats within the diet have been shown to reduce the levels of a substance called lipoprotein (a) which is linked to an icreased risk of heart disease. More and more studies are being conducted to examine the effect of saturated fats on our health and investigate the correlation between saturated fats and risk of heart disease. These studies are now reporting a diet containing significant levels of saturated fats is not directly related to an increased risk to cardiac disease. Some reports suggest a diet rich in saturated fats reduced a risk of heart disease while other suggest the issue may lie more with the consumption of large amounts of carbohydrates along with the saturated fats. Recent studies conducted on a group of men in Australia examined the benefit of substituting saturated fats in the diet with unsaturated fats. All the men (458 men aged 30 – 59) in the study had suffered a recent coronary event. Results from these studies showed an increase in the risk of death from coronary heart disease and cardiovascular disease in the group that substituted vegetable derived polyunsaturated fats for saturated fats in their diet. You can tell from this blog that my fridge contains only butter (no margarine need apply); I should also point out that my family does not contain any dairy intolerant members! So butter it is…however I do acknowledge that butter can contain a lot of salt, that the fat content is very high and that, although made from one basic ingredient, the quality of that ingredient – cow’s milk – depends on the quality of the cow! How the cow is fed and treated naturally effects the butter produced. So, like anything else, we need to shop wisely, choose the food that meets our own standards as much as possible (be that reduced salt, organic etc) and keep to that age old recommendation…. EVERYTHING IN MODERATION! Yep, margarine isn’t good is it? I keep meaning to make butter, got my Kenwood repaired 2 weeks ago so I’ve no excuse now being married to a dairy farmer – except for lack of time!